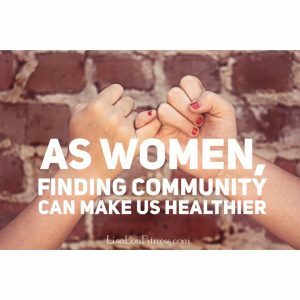 Did you know that, as women, needing community is more than just a cultural norm but actually has biochemical roots and has very direct effects on our stress levels and, therefore, overall health?As it turns out, when a woman has a gap in positive social relationships, oxytocin (hormone) is released in response, which encourages us to fill those gaps. This is when many of us will often intuitively seek out social interaction: join a mom's group, meet a new neighbor, join an exercise group, etc.If we are negatively accepted by any of these interactions, the sympathetic nervous system (what you may know of as fight or flight, but can be increased in times of feeling isolated) becomes more heightened, and the brain is stimulated to release a series of hormones in an effort to battle the stress which can lead to feelings of anxiety, depression, fatigue, etc.However, when we are positively accepted into a relationship or group, the opposite effect takes place. When that mom's group is jazzed to have us or when that exercise group welcomes us with open arms (REFIT® anyone? ), those gaps begin to fill biochemically (socially, emotionally, and spiritually, as well). Our sympathetic nervous system is quieted, our overall stress response is decreased because our cortisol levels become more normalized, and we feel better equipped to handle other life-stressors. In short, we become wonder women, of sorts, and are far more capable to take on life's demands when we have community.So who or what makes up your social group? What community, support system, or network of friends have you established to help fill those gaps to help you function at your very best?